A recent move to the DC area had me putting more miles in a vehicle for work than I had anticipated. A brief family discussion later and we made the decision to do a vehicle switch. The goal was simple; get a small car that has good gas mileage. I admit it, I have a personality of extremes. The natural move was to sell my most prized possession, a Dodge Ram 1500 quad cab truck, and buy a used Toyota Prius. This was not an easy switch. I am an avid part time angler and full time American so driving a truck is something of a cultural image requirement. This switch means that my fishing boat would have to be pulled around by the family SUV and I would be relegated into a clown car the majority of the time. 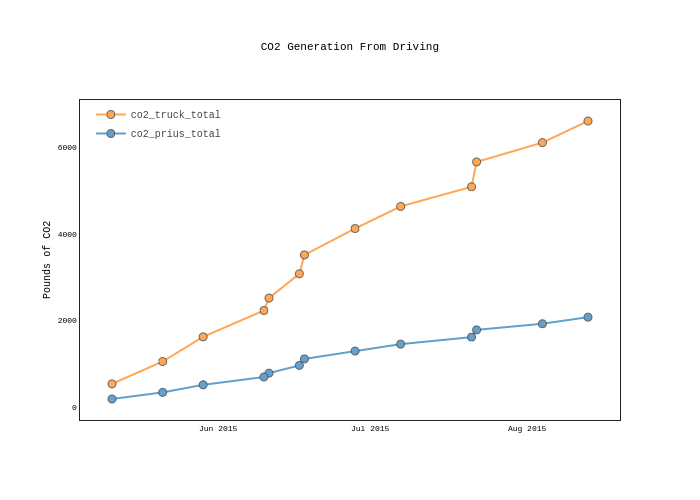 The following visualizations detail the difference between driving a Prius and the same average usage as if I was still in the truck. The first view is the running savings from the switch. There are three areas that I saved money; lower payment, lower insurance cost, and, of course, gas. 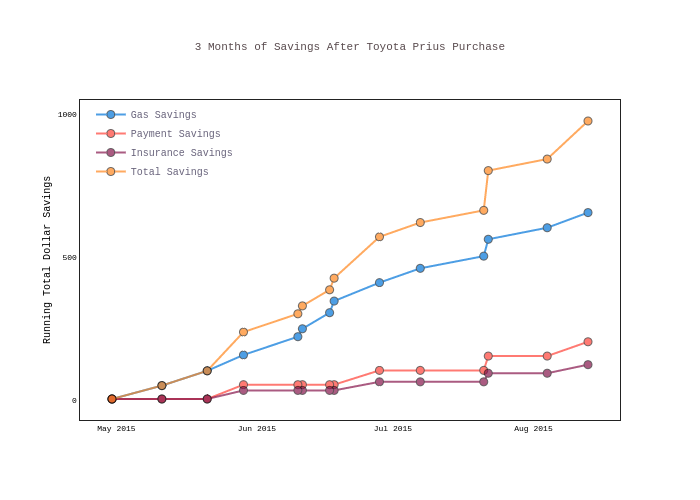 Total savings add up quickly, however, the major cost savings component is fuel. It is obvious that a Prius would have better fuel economy but the savings are much greater than I had assumed ~$2,000 per year. 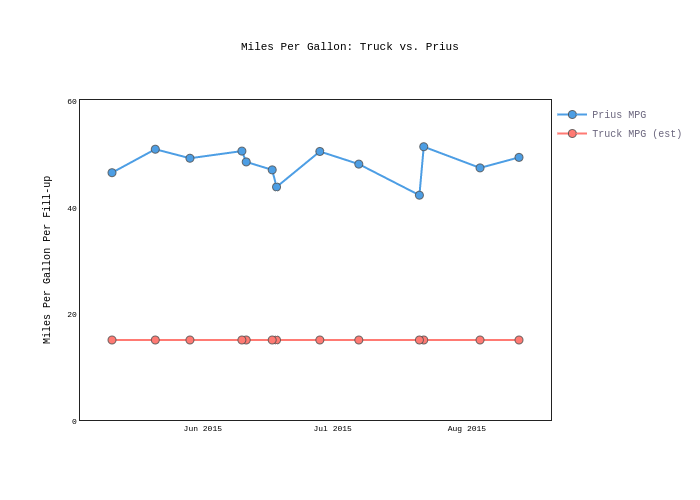 Here is a view of the actual mpg I realized with the Prius compared to the average from the truck. The truck uses a lot of gas, again another obvious statement. 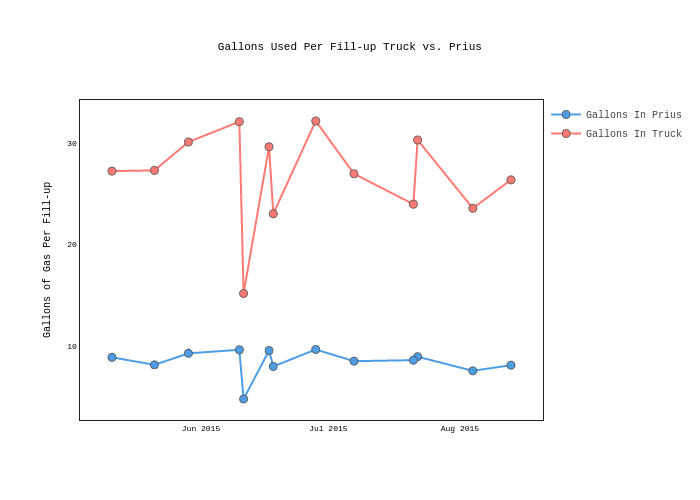 Here is a view of how many gallons it would have taken the truck to go the same distance as the Prius. The switch has been a huge success in cost savings. In addition, there are many other added benefits. For example, I now fit in all of the parking garages and spaces in DC. No more circling the block in Arlington or the National Mall looking for street parking! There is also an environmental component to the switch. Burning less gas means fewer pollutants in the air. Here is a view of CO2 production over this time. The truck has an environmental impact nearly three times that of the Prius. Anyone considering the switch to a smaller vehicle would do well to weigh the significant benefits. I can expect to spend $3,000 less each year if my driving habits remain the same. When time permits I like to write about data. Here are some of my thoughts that have made it through.